Rotary Scroll Air Compressor Market size was estimated over USD 1.5 billion in 2016 and the industry will grow by a CAGR more than 2.5% up to 2024. Growth in food and beverage industry will boost the rotary scroll air compressor market due to rising demand for processed food products, especially in North America and Asia Pacific. Several countries such as the U.S, China, India, etc. will witness a steady rise in the demand for packaged ready-to-eat food & beverages in future. This will contribute to the rotary scroll air compressors market as the product is extensively used in the food processing industry for a variety of applications such as vacuum packaging, bottling, cleaning, closing and checking devices, for nitrogen generation, and for mixing and movement and many other processes. Increasing demand for clean and contamination free air in food & beverage industry will enhance the product demand over the forecast time frame. The oil free rotary scroll air compressors are extensively used in this sector as it reduces the risk of contamination in food products by supplying the clean, dry and contaminant free air. Several regulations have been introduced for energy conservation, noise level and greenhouse gas emissions from the product, particularly in developed countries of North America and Europe. Silent, energy efficient and negligible gas release at the time of operation are the key features of the product which will boost the rotary scroll air compressor market in coming years. The greenhouse gas emissions from the heavy-duty products are a cause for concern with many government agencies setting up mandatory frameworks and ecological requirements for industrial equipment. The European Union’s mandatory framework for any energy using industrial equipment, which is responsible for greenhouse emissions is one such example. These regulations have resulted in the development of energy-efficient products with better pollution-control mechanisms. Popularity of air compressor rental services is one of the key restraining factors for rotary scroll air compressor market growth in forecast timeframe. Small and medium scale enterprises, which do not require compressed air regularly usually opt for renting the product rather than buying them. This is due to the high purchasing and maintenance costs associated with the product. Rental operations also give the end users increased flexibility toward different compressed air requirements. Rotary scroll air compressor market is segmented on the basis of lubrication type into oil-free and oil filled. Among these, oil-free segment accounted for more than 70% of the total market share in 2016 and the segment is projected to grow at a significant rate by 2024. Extensive usage of the silent rotary scroll air compressors in critical applications such as medical & healthcare, food & beverage, etc. will enhance the demand for oil-free products in the forecast years. Oil-filled product segment of the rotary scroll air compressor market is likely to experience sluggish growth in coming years. The product is used in manufacturing sector as they offer smooth operation feature and suited for heavy duty applications. Usage of heavy duty screw, reciprocating, and centrifugal compressors will pose substantial threats to this product segment in coming years. The rotary scroll air compressor market is bifurcated into five major application segments which include food & beverages, healthcare, manufacturing, dental, semiconductor & electronics. Minor applications such as chemical, packaging, textile, painting, etc. have been included in the others segment. Food & beverage application segment generated revenue over USD 200 million in 2016 and is likely to grow at a substantial rate in forecast period. This segment’s growth will be driven by rising contamination-free and consistent compressed air demand to run production process. Medical application segment accounted for over 35% of the overall rotary scroll air compressor market share in 2016. This is attributed to extensive product usage in diagnostic tools such as blood-analyzers, endoscopy equipment, mammography X-ray, etc. Asia Pacific rotary scroll air compressor market was valued above USD 800 million in 2016 and will likely grow healthily over forecast period. Asian countries such as India, China, etc. will be the key contributors to the regional industry growth. Growing healthcare awareness and presence of large elderly population in the region is likely to fuel the healthcare sector. This, in turn, will drive the regional rotary scroll air compressor market owing to the wide application of product in medical facilities, diagnostic centers, dental milling machines, and other medical tools. North America is also an important market accounting for over 12% of the total share. This region is likely to witness the significant growth owing to government regulations and incentives which promote the usage of energy efficient equipment. The product demand from food & beverage application segment will bolster the regional market by 2024. 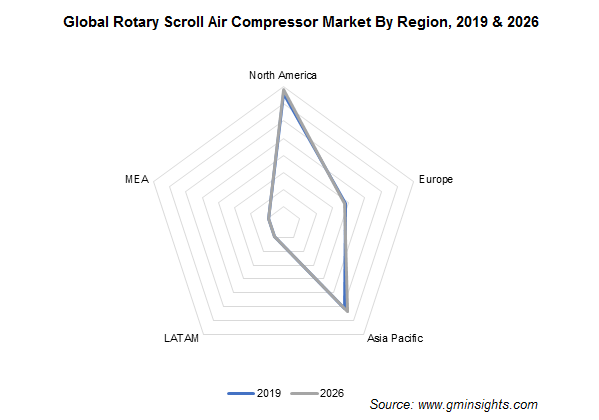 The mature semiconductor & electronics industry in the U.S. and high demand of electronic appliances will also boost the rotary scroll air compressor demand in forecast years. The prominent players in rotary scroll air compressor market which holds the major chunk include Atlas Copco, Gardner Denver, Hitachi, Emerson, Ingersoll-Rand and Sullair. The other players include Air Squared, Boge Compressors., Ohio Medical Corp, Powerex Inc, etc. Companies compete through acquisition and merger methods to maintain the market stronghold. For instance, Atlas Copco acquired companies such as Glauber Equipment to enhance the product portfolio and expand global reach in the industry. Rotary scroll air compressor market is majorly driven by various end-user industries including medical, dental, food & beverage, manufacturing, and others. Intrinsic properties to provide a continuous supply of compressed air with silent and vibration free mechanism will boost the product demand in the forecast years. Technological advancement and increasing demand for advance products in healthcare and other manufacturing machineries will boost the industry growth over the forecast period.